This practice illustrates how to prepare the SEA report for maritime spatial plans in line with the spirit of the SEA Directive when the planned area contains Natura 2000 sites. The SEA prepared in Poland clarifies methodological differences in preparation of the SEA for Natura 2000 sea sites and other waters, examines the impact of the plan implementation on human beings as part of the environment and coves sea-land interactions. The pilot SEA was developed in 2012 in the framework of the BaltSeaPlan project aiming at (among others) advancement of the MSP methodology in the Baltic Sea Region countries at the stage of building their readiness to start maritime spatial planning. The SEA report concerned the Pilot Maritime Spatial Plan for the Western Part of the Gulf of Gdańskelaborated in 2008. 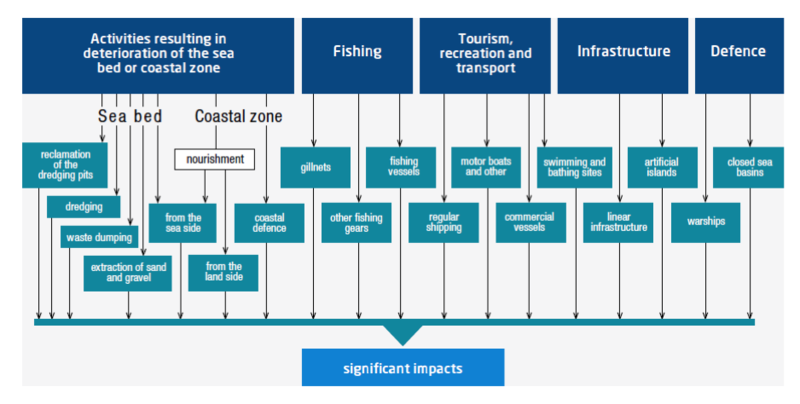 This Polish attempt illustrates how to prepare the SEA report for maritime spatial plans in line with the spirit of the SEA Directive when the planned area contains Natura 2000 sites. The SEA prepared in Poland clarifies methodological differences in preparation of the SEA for Natura 2000 sea sites and other waters, examines the impact of the plan implementation on human beings as part of the environment and covers sea land interactions (for instance, the impact of implementation of a maritime plan on the terrestrial environment).It has been elaborated in Polish only. As a pilot SEA, it is not legally binding. The SEA report aimed at supporting the preparedness of Polish authorities for introduction of the MSP in Polandwith a focus on clarifying methodological issues of assessing the environmental consequences of the maritime spatial plans. The experience supported development of the requirements for the SEA report under official statutory MSP process in Poland that started in 2013. 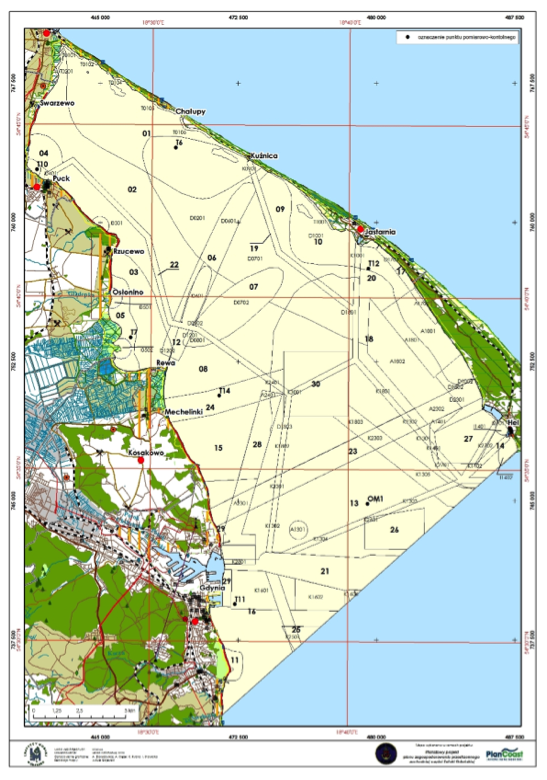 The area of the SEA covers the area of the Pilot Maritime Spatial Plan for the Western Part of the Gulf of Gdańsk. The plan covers a part of internal sea waters of the Gulf of Gdańsk. The area has the surface of about 40,550 ha, situated to the west of the line connecting the head of the Hel Peninsula with the Gdynia/Sopot boundary, with the exclusion of the area of harbours of Gdynia, Puck, Jastarnia and Hel, closed by breakwaters and submitted to limitations concerning land areas. Preparation of the SEA was funded within the framework of the Baltic Sea Region Programme 2007-2013 and was cofunded by the EU. The BaltSeaPlanproject duration was 2009-2012. BaltSeaPlan project accompanied the EU Maritime Policy by supporting the introduction of Integrated Maritime Spatial Planning and preparation of National Maritime Strategies within Baltic Sea Region. One of the key problems for such SEA is proper identification of all sea uses with significant effects on the environment–pilot SEA proposed methodology how it can be done. When the SEA covers Natura 2000 areas it is equally important to understand the reason for creating them (what is to be protected) and critically verify those ambitions against reality, the actual situation in the habitats. Only proper interactions with stakeholders and environmental authorities, allows for preparation of a detailed list of objects (environmental elements) that should be subject to the assessment of the impact of the plan implementation. In the Polish case it was decided to conduct a separate assessment for the elements (components) of the environment and for objectivesandsubjects being under the protection of the Natura 2000 network. One of the most critical steps is working out a typology of impacts with clear definitions. From the point of view of the essence of the SEA, a key issue was to define the significant negative impacts. In the Polish case it was done in three steps: identification of potential significant impacts, analysis of expected significant impacts, and assessment of expected significant impacts. Communication with stakeholders is a key precondition for the SEA success. It is important that tools allow clear presentation of different impacts, their location and intensity. In the Polish case different types of matrixes were elaborated for the presentation of cumulative significant impacts of different types of uses (sources of impacts) on conservation objectives, subjects of protection, the integrity of Natura 2000 sites/areas and on all other components of the natural environment. In accordance with the SEA Directive, all impacts should beclassified as: direct or indirect, short or medium or long-term, or permanent or temporary, strong, medium or weak, positive or negative ones. This is not an easy task, since the Directive gives no clear definition of those terms. Polish SEA offers unique definitions of some of thoseconcepts that have been precisely defined in relation to sea processes. Different types of impacts should be communicated to stakeholders in relation to the objects of impact. This part of the work is critical since forms a core of stakeholder debate (in case of cross-border impacts also debate with transnational stakeholders). Thus it is of the utmost importance to present the impacts in a clear and objective way. Some types of usage e.g. wind mills have not been considered as excluded by law in the territorial waters of Poland.Some other sources (mariculture, extraction of oil and gas) have not been analysed due to the plan provisions excluding them from the whole area of the plan. A vigorous stakeholder process is instrumental for the success of SEA. Stakeholders should be involved from the outset (as a part of the preparation of the plan) for identifying different impacts and discussing the cumulative matrixes. Such a discussion should have an iterative character as a stakeholder learning process. In Polish case two meetings with stakeholders were organised for the identification of impacts and for a discussion on the results. SEA report covered territorial waters located far away from any sea borders of Poland. Therefore it was not consulted with the foreign stakeholders. This was also due to the pilot character of the entire attempt and the aim of development of a methodology for elaboration of the environmental reports.